Nanook prepares to launch his harpoon in 'Nanook of the North' (1922). As I write this, New England is about to be buried under anywhere from one to two feet of snow. Your mileage may vary, but forecasts call for a significant storm on Tuesday, Jan. 27. Well, it's winter here. And what better setting to take in a ground-breaking documentary about life north of the Arctic Circle? 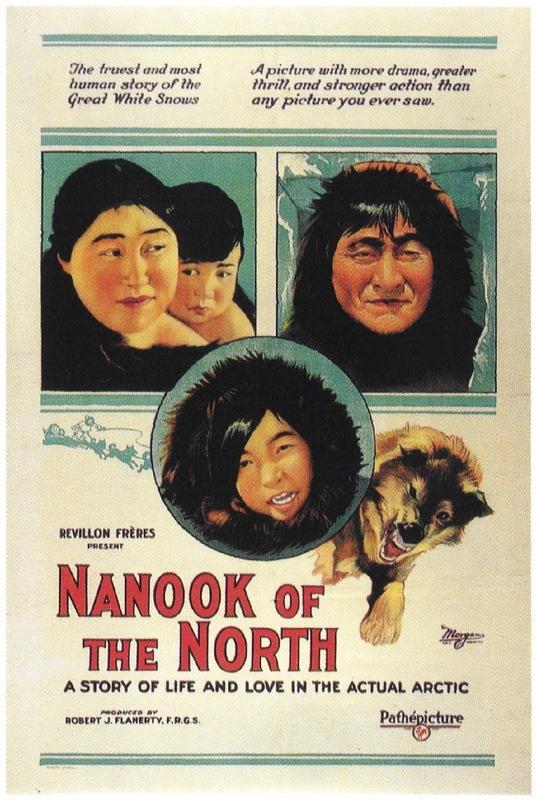 Yes, coming up are two chances to see 'Nanook of the North' (1922), Robert Flaherty's hit 1922 look at Nanook and his family as they struggle to survive. You can see it on Friday, Jan. 30 at 7 p.m. at the Harvard Film Archive in Cambridge, Mass. And it's being screened again on Tuesday, Feb. 3 at 6 p.m. at the Manchester (N.H.) City Library. More info about the screenings and the film is in the press release below. But let me say I'm really looking forward to these screenings, as 'Nanook' is one of the "big" silent film titles that I've yet to tackle—until now. As a documentary, it lends itself to a very different approach for music than a traditional narrative story. Rather than straight-up melodies or tunes, I'll probably head in the direction of "textures." By that, I mean repeated patterns, cells, and cycling chord progressions. For a documentary, I do think there's quite a bit of emotion that can be mined from finding a suitable texture and then adjusting it as the scenes change. 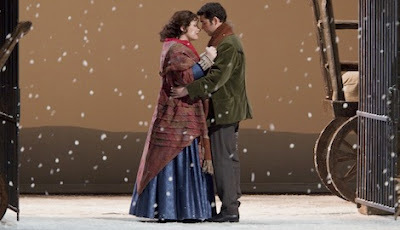 Well, I keep thinking of how Puccini created an atmosphere of "cold" in La Boheme by harmonizing things in open fifths. That may play a role in what happens next Friday night at the Harvard Film Archive. We'll see. In any case, you might want to bring an extra coat. The man himself. Like Elvis or Liberace, he needs only one name. Ground-breaking silent film to be screened in 35mm with live music on Friday, Jan. 30 at 7 p.m.
CAMBRIDGE, Mass.—A film hailed as the one of the first to show the potential of the movie camera to take audiences to distant lands will be shown this week at the Harvard Film Archive. 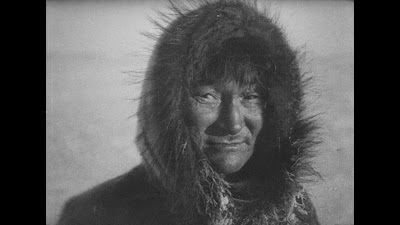 'Nanook of the North' (1922), a ground-breaking film about life among Eskimos above the Arctic Circle, will be screened on Friday, Jan. 30 at 7 p.m. at the Harvard Film Archive in Cambridge, Mass. The classic silent documentary, to be screened in 35mm, will be shown with live music by silent film accompanist Jeff Rapsis. 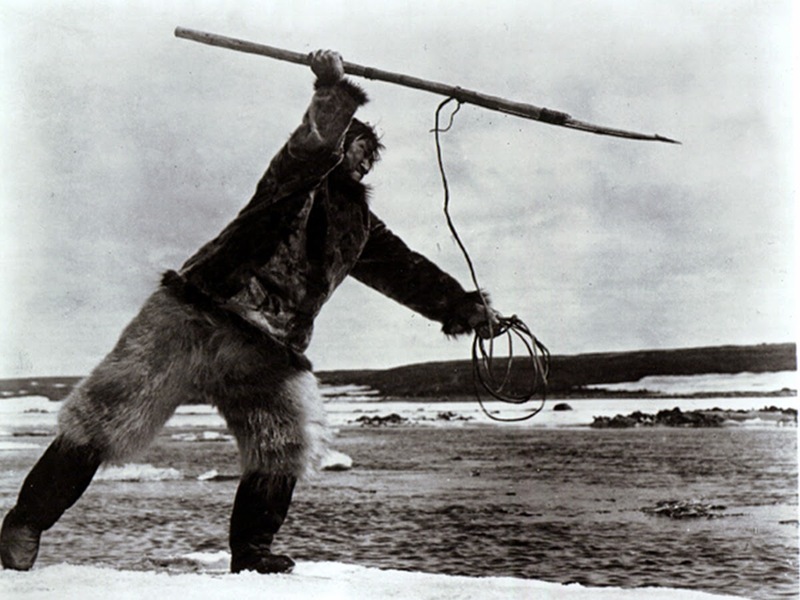 Director Robert Flaherty’s film tells the story of Inuit hunter Nanook and his family as they struggle to survive in the harsh conditions of Canada’s Hudson Bay region. The screening is part of a retrospective of Flaherty's work and career that continues through March 1 at the Harvard Film Archive. Remarkably matter-of-fact in its blow-by-blow depiction of the everyday struggle to stay alive in the Arctic hinterlands of Canada’s Hudson Bay, 'Nanook of the North' expresses Flaherty’s reverence for his Inuit subjects in every carefully framed shot. The film, which emerged from a return trip up North after celluloid from a preceding adventure went up in flames, unfolds as a series of long takes interspersed by occasionally poetic intertitles, all of which serve to highlight seemingly mundane tasks required for survival in the frigid terrain. 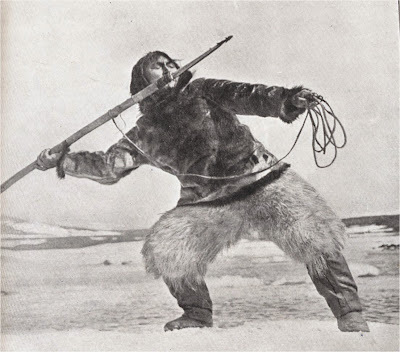 Beyond its educational function, though, Flaherty’s profoundly empathetic intimacy with his subjects—the resilient, prodigious seal-and-walrus-hunter Nanook and his weathered clan—heightens what seems on the surface to be merely a dry informational pamphlet. To make the film, Flaherty built an ad-hoc film processing lab in the challenging Arctic conditions and trained his Inuit friends to be his technicians. Immersed in the culture for over two years, Flaherty embraced the new artform as a transformative vehicle to show modern audiences that without all the complications and trappings of modern civilization, lives could be happily lived—even under nature’s harshest conditions. 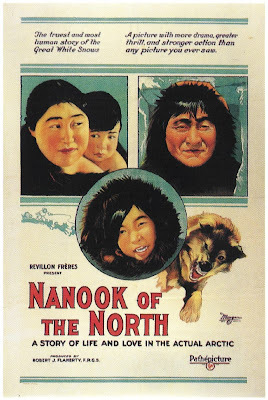 Enormously popular when released in 1922, 'Nanook of the North' is a cinematic milestone that continues to enchant audiences. In 1989, 'Nanook of the North' was one of the first 25 films to be selected for preservation in the U.S. National Film Registry by the Library of Congress as being "culturally, historically, or aesthetically significant." ‘Nanook of the North' (1922) will be shown in 35mm with live music on Friday, Jan. 30 at 7 p.m. at the Harvard Film Archive, located in Carpenter Center for the Visual Arts, 24 Quincy St., Cambridge, Mass. Tickets are $9 per person/$7 students & seniors. For more information on the screening, visit http://hcl.harvard.edu/hfa/ or call 617-495-4700. For more information on the music, visit www.jeffrapsis.com. Our group's Kilimanjaro summit photo, taken at 6:30 a.m. on Saturday, Jan. 10, 2015. Okay, I'm back in silent film mode after three weeks in Tanzania, a journey that included a 10-day expedition to the top of Mount Kilimanjaro. All 12 members of our party made it to the 19,341-foot summit, the highest point on the African continent. I'll post a full account of this adventure as soon as my head stops spinning. The summit, by the way, is called "Uhuru Peak," using the Swahili word for "freedom." But prior to Tanzania's independence in the 1960s, it carried the imperialist moniker of "Kaiser Wilheim Spitze." Why? Because Kilimanjaro was part of Germany's colonial empire when geologist Hans Meyer in 1889 became the first European to reach the top. But by then, Germans were on their way to creating a new empire—this time in silent cinema. The 1920s were a time of bold experimentation in German movie-making, and the result was a body of work that would prove much more durable than their colonial empire. And one of the major achievements of this period, I think, is Fritz Lang's ground-breaking sci-fi espionage soap opera 'Woman in the Moon' (1929). I feel 'Woman in the Moon' is an underrated film, long overshadowed by Lang's spectacular 'Metropolis' from 1927. Come to think of it, the lunar landscape of 'Woman in the Moon' doesn't look that much different from parts of Kilimanjaro. As such, I love presenting it to audiences, as they always seem to come away surprised that a film like this could even be made during the silent era. It's also a great film for music, and seems to bring out the best in me whenever I accompany it. In the coming week, we'll screen 'Woman in the Moon' not once but twice in our part of the world. First up is Wednesday, Jan. 21 at 7 p.m. the Rogers Center for the Arts at Merrimack College, North Andover, Mass. And then I'll do it again on Sunday, Jan. 25 at 4:30 p.m. at the Wilton Town Hall Theatre in Wilton, N.H. Both screenings are free and open to the public. Hope you can make it! For more info about the screenings and the film, below is the press release that went out to promote the screening on Wednesday, Jan. 21 at Merrimack College. NORTH ANDOVER, Mass.—A sci-fi adventure hailed as the first feature film to depict realistic space travel will be shown in January at Merrimack College. 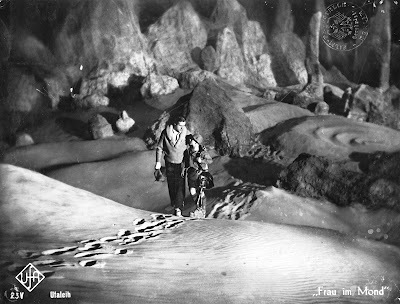 'Woman in the Moon' (1929), directed by German filmmaker Fritz Lang ('Metropolis,' 1927), will be screened with live music on Wednesday, Jan. 21 at 7 p.m. at the Rogers Center for the Arts, Merrimack College, 315 North Turnpike St., North Andover, Mass. The rarely seen full-length version of 'Woman in the Moon' follows an intrepid band of space pioneers as they attempt mankind's first voyage to the lunar surface, where they hope to find large deposits of gold. The film, made with German rocket experts as technical advisers, is noted for anticipating many of the techniques used by NASA for the Apollo moon launch program 40 years later. For example, a multi-stage rocket is employed to escape Earth's gravity, and a separate capsule is used to reach the lunar surface. 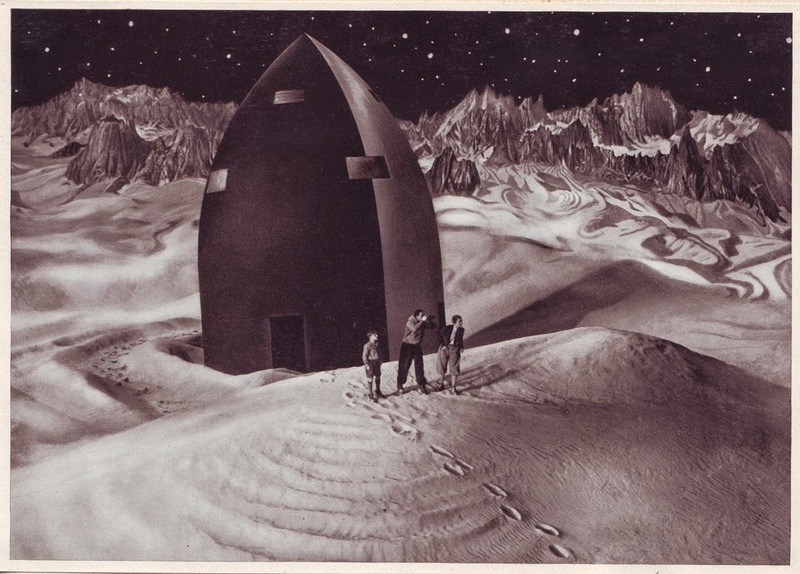 But 'Woman in the Moon,' with its melodramatic plot and colorful characters, also stands as the forerunner of many sci-fi story elements that quickly became clichés: the brilliant but misunderstood professor; a love triangle involving a beautiful female scientist and her two male crewmates; a plucky young boy who yearns to join the expedition; fistfights and gunfire and treachery on the lunar surface. 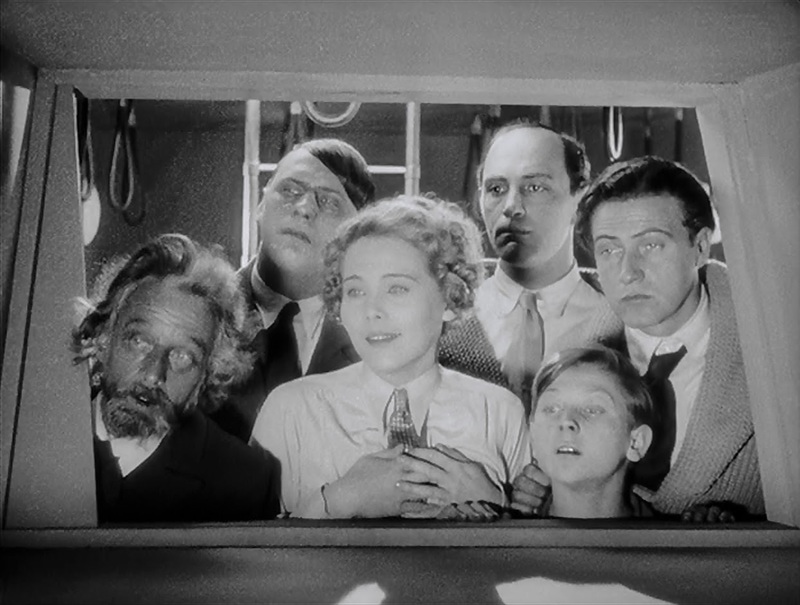 "This is a great and at-times bizarre film, one that must be seen to be believed," said Jeff Rapsis, a New Hampshire-based silent film accompanist who will create live music for the screening. "It's as entertaining as any spy-thriller. And as a past vision of a future that didn't quite come to be, it really gets you thinking of time and how we perceive it." Rapsis, a resident of Bedford, N.H., will improvise live musical accompaniment during the screening, using both an acoustic piano and a digital synthesizer to recreate the sound of a full orchestra and other more exotic textures. Cast member Willy Fritsch, as "Helius," prepares for launching mankind's first manned moon voyage. 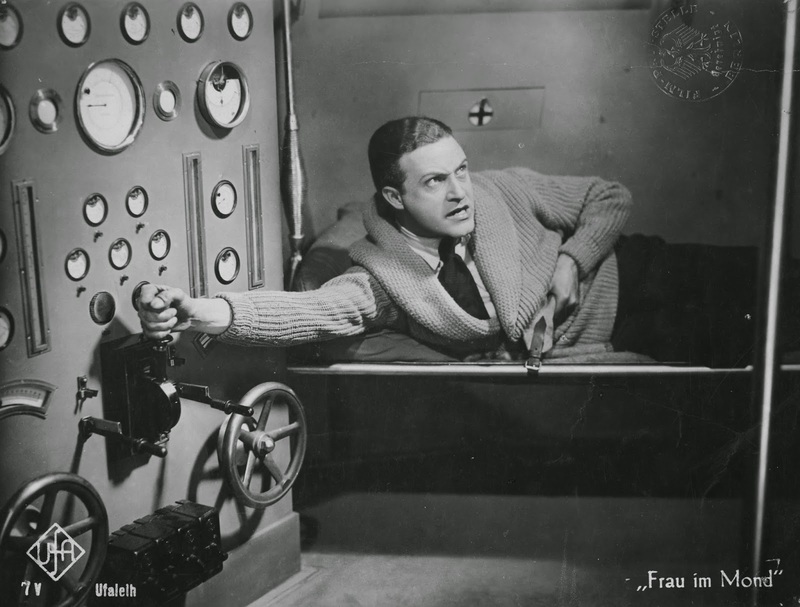 Director Fritz Lang, who was responsible for the groundbreaking sci-fi epic 'Metropolis' (1927), planned 'Woman in the Moon' as another step in his quest to stretch cinema's visual, story-telling, and imaginative capabilities. 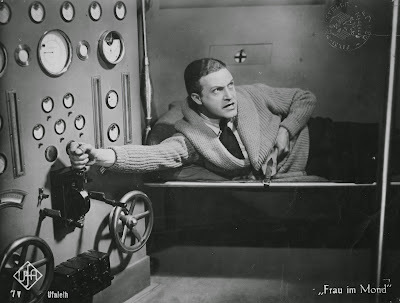 However, German rocket scientist Hermann Oberth worked as an adviser on the movie, and it developed cult status among the rocket scientists in Wernher von Braun's circle. 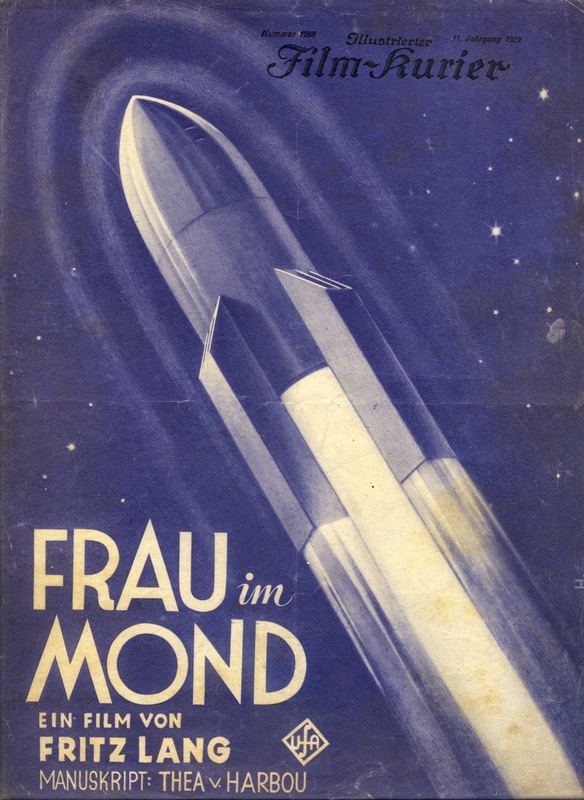 During World War II, the first successfully launched V-2 rocket at the German rocket facility in Peenemünde had the "Woman in the Moon" logo painted on its base. As their spacecraft nears the moon, the cast of 'Woman in the Moon' look back at the receding Earth. All movies in the Rogers Center’s silent film series were popular when first released, but are rarely screened today in a way that allows them to be seen at their best. They were not made to be shown on television; to revive them, organizers aim to show the films at the Rogers Center as they were intended—in top quality restored prints, on a large screen, with live music, and with an audience. ‘Woman in the Moon’ will be shown with live music on Wednesday, Jan. 21 at 7 p.m. at the the Rogers Center for the Arts, Merrimack College, 315 North Turnpike St., North Andover, Mass. Admission is free. For more information, call the Rogers box office at (978) 837-5355. For more info on the music, visit www.jeffrapsis.com.